The AASHTO Journal reported a story on the first electric car charging station that opened this month, in Alamance County's rest area located on Interstate 40/85 in North Carolina. 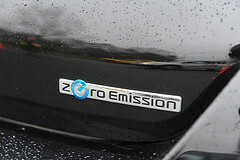 It is the first site in the US and has two charging stations. The charging stations are Level 2, which means they can fully charge a vehicle in 6-7 hours and there is no charge for using them. North Carolina Department of Transportation (NCDOT) is continuing to work with private partners to investigate the possibility of installing more charging stations at rest areas in the future to include "Level 3" stations, which are able to fully charge a vehicle in as little as 30 minutes. Electric vehicles are definitely coming our way, it's just a matter of time. Someday, I can see our gas vehicles totally going away, much like the 8 tracks we used to use. Most of our children don't even know what an 8 track is....or should I say, was? AAA Idaho Survey How Should Local Taxes Be Spent? A current AAA of Idaho survey reveals growing support for legislative action that would give local option tax the authority for transportation funding purposes. According to the survey, registered voters were given a choice of where and how the additional revenues from local option taxes could be used. 59% said that they would approve the use of sales tax receipts to help pay for road and bridge infrastructure. 19% said it should be used for public transportation, including buses, vans, and rails. And 22% claimed to be undecided. Transportation Funding - Thinking Outside the Box - What Ideas Do You Have? The need to fund transportation and the problems associated with it have been all over the news lately, especially with the upcoming transportation bill. Everyone agrees that we need to maintain our existing infrastructure (roads and bridges) but the problem appears to be, who is going to pay for it? Taxpayers appear to be tired of paying so much in taxes and have expressed they don't want to pay more. 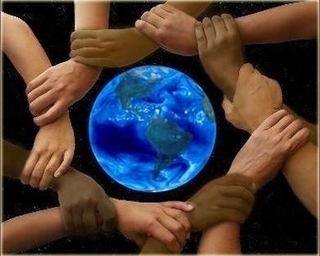 So, I here's an idea, it's a different way of looking at it, I am just throwing it out there, and is not the opinion of KMPO or any of KMPO's affiliate agencies or members. 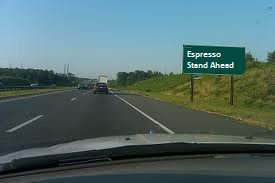 Having State Franchised Espresso stands located along the highway and freeways, with an enter/exit ramp solely for the purpose of the coffee stands, much like pulling off the highway to enter or exit a weigh station. It would be a short jaunt off and back onto the highway. The state already owns right-of-way and some stands could be located within an existing rest area stop. I realize the State, most likely, doesn't want to be in the coffee franchise business, but it would be a great source to generate additional transportation funding and it would provide additional local jobs at the same time. I heard yesterday, on talk radio, that the average American spends $1000 per year on coffee. If just 25% of Kootenai County's total population utilized the franchised espresso stands (based on that estimate), they would generate over $34,000,000.00 per year within, Kootenai County. The investment for the stands would be minimal, compared to the amount of revenue collected, and if the money collected was used solely for transportation, to build or maintain infrastructure, the public would support it and they would be getting something in return. It's a win-win situation. And, what would be better than providing weary travelers, (local and long distance) with caffeine to wake them up? Just an idea! What's your thoughts? Any opinions or other ideas??? Making TUBBS Hill Wheelchair Accessible? How many people do you think would enjoy it? 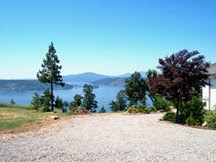 The city of Coeur d'Alene's Parks and Recreation Commission is recommending the city alter the east side of Tubbs Hill to make the popular hiking trail more accessible for people with disabilities. The changes would improve wheelchair accessibility on the downtown hill. The plan calls for work on around 1,500 feet of trail beginning at the east side entrance near the marina. It would smooth the natural surface and decrease slope grades on portions of the trail from 15 percent grade, down to around 5 percent. The work would maintain a minimum width on the trail of 48 inches. Most of it already meets that standard, said Doug Eastwood, parks director. They could add some retaining walls to the very narrow areas. 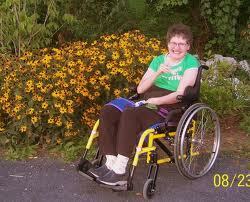 Trail work would use native soil, he said, and could expand the trail in parts to implement turnouts for wheelchairs. 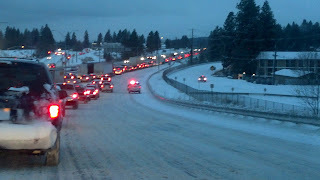 Since driving back and forth on I-90, I've been seeing some crazy accidents. 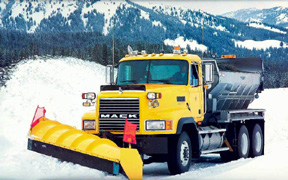 I know the Transportation Departments (ITD &WSDOT), along with all the local jurisdictions, do their best to make the roadways safe for us (and if your reading this a HUGE "Thank you", along with all other Emergency Personnel, for "ALL" your hard work)! other specialty communication device (in most cases). 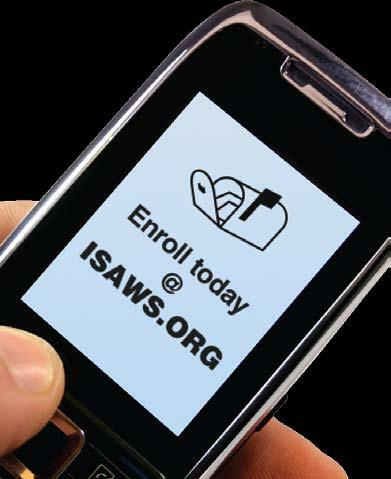 and Idahoans have their choice of how they would like to receive ISAWS messaging. preceding. You may also choose between voice and text messaging, or both. Enrollment in this valuable service is easy. Simply follow the "Sign Up" link above to enter your preferences and begin receiving emergency notifications. Your information is secure and not shared with any other organization or group (with the exception of emergency preparedness and response service providers for emergency planning purposes). Go to: http://www.isaws.org/ to sign up and find out more information about ISAWS. Speaking of Snow...What is a SNOTEL? In case you ever wondered (like I did) what a SNOTEL is? SNOTEL's are U.S. Department of Agriculture sites that measure snow powder across Idaho. 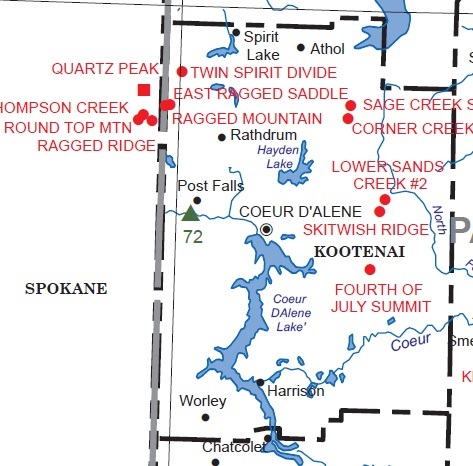 In fact, they exist in Kootenai County locally in the following cities; Rathdrum, Post Falls, Coeur d'Alene, Spirit Lake, Athol, Harrison and Worley. 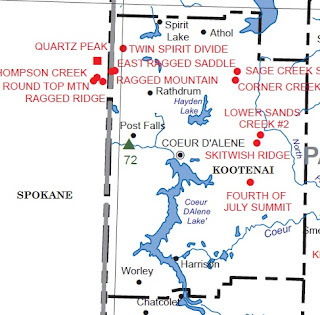 There are a total of 84 sites in Idaho, that measure snow depth, weight and water content. Many also keep track of soil moisture, humidity and wind speed. The data they collect is beamed through radio signals to a station in Boise, where it helps to determine how much snow melt they can expect in the spring. Here is a link to an article in the Idaho Press on nearly everything you wanted to know about them. So please answer the following questions honestly. We’ll evaluate your scores at the bottom. a. Those chicken-hearts who spend their winters in Arizona – 1 igloo. b. 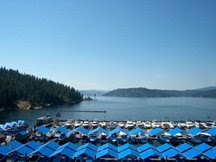 The annual influx of eagles at Lake Coeur d’Alene – 3 igloos. c. That middle-fingered salute you wag at idiots who can’t drive in snow – 5 igloos. a. Years of professional driving experience – 1 igloo. b. The willingness to work all hours under extreme conditions – 3 igloos. c. A sadistic desire to turn every driveway entrance into an impassable avalanche – 5 igloos. a. The larger the shapeless mass on the TV weather radar – 1 igloo. b. The easier the forecast – 3 igloos. 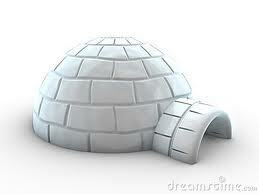 c. The more a TV weathercaster will act like a gibbering fool – 5 igloos. a. A scraper specifically designed for the task – 1 igloo. b. A debit card or used McDonald’s sack – 3 igloos. c. Hit the “defrost” button. The faster you get going the faster things’ll melt – 5 igloos. a. Allow an extra 15 minutes to get wherever you’re going – 1 igloo. b. Stay an extra car length behind the driver in front of you – 3 igloos. c. Reduce your speed 5 mph and text your friends about why you’re going to be so late – 5 igloos. a. A snow shovel – 1 igloo. b. Some food and a blanket – 3 igloos. c. One large empty coffee can – 5 igloos. a. Winter weather advisories – 1 igloo. b. Street and school closures – 3 igloos. c. Additional hot air from blowhard Mike Fitzsimmons – 5 igloos. a. Quality snow tires – 1 igloo. b. Wipers that work – 3 igloos. c. Paid-up AAA membership – 5 igloos. a. Only drive if you must – 1 igloo. b. Never drive faster than conditions allow – 3 igloos. c. Park your car and wait until spring – 5 igloos. a. Steer into the slide – 1 igloo. b. Tap your brakes lightly – 3 igloos. c. Scream “Holy %$^#! !” and reach for the coffee can – 5 igloos. "A score of 10-25 igloos indicates you’re one of those overconfident know-it-alls the rest of us would like to push off a cliff. Scoring 30 to 40 igloos suggests that if you’re not on Prozac, you should probably look into it. If you scored a perfect 50 igloos, congratulations! You are definitely a Spokane- area driver. Blink your lights and honk if you see Big Maroon coming. That should give me enough time to flip you the snowbird and swerve out of your way", Doug Clark, Spokesman Review. While the Idaho speaker of the House, Rep. Lawerence Denney, R-Midvale, believes the remaining funds available for the road and bridge work financed in part by GARVEE Bonds could pass this session of the Legislature (after not making it through the 2011 Legislature), Senator Jim Hammond, R-Coeur d'Alene, chairman of the Senate Transportation Committee, disagrees, seeing it as an uphill fight, likely to fail. 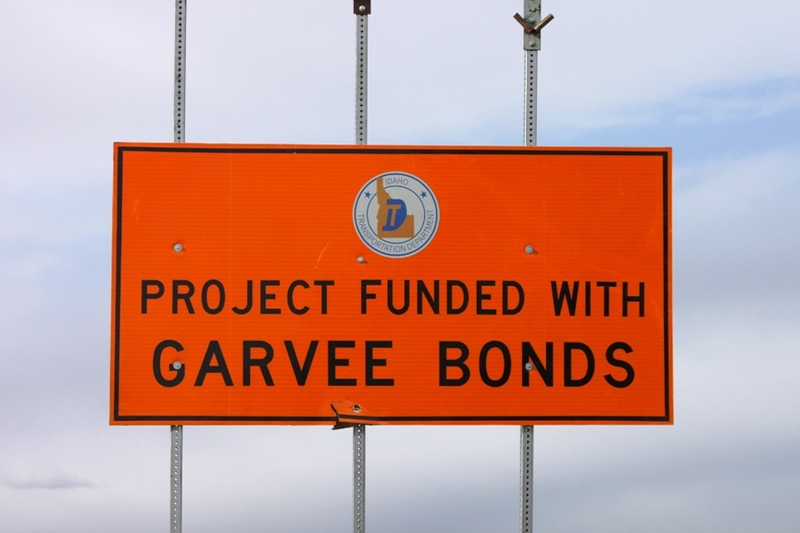 GARVEE (grant anticipation revenue vehicles or a GARVEE) are tax-exempt bonds to finance road improvements throughout Idaho. These road improvements, undertaken by the Idaho Transportation Department (ITD), are to be repaid from federal highway funds received over a 20-year period from the Federal Highway Administration and certain state matching funds. 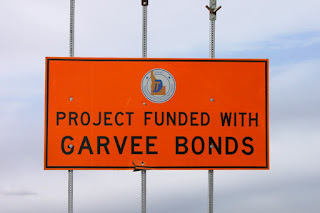 Of the initial $998 million in GARVEE bonds authorized, there is $143 million available to the state. Senator Jim Hammond feels GARVEE will be a tough sell because of legislative reluctance to take on another program and because the funds are available due to borrowing from the federal government and he sees little support, including himself, for relying on the feds for the money. Senator Hammond also worries if the federal funding level Idaho is receiving continues to decrease, then the state must take more money from operating costs to pay for those bonds, which, in turn, makes it tougher for the state to maintain what it currently has. In addition, Hammond says there is sentiment among some in the Legislature who consider GARVEE bonding as an indebtedness to its citizens, putting them on the hook for monetary obligations years down the road. If the Legislature does not approve additional GARVEE funds, how does the state deal with the need for not only road and bridge repairs, but also expansion and replacement? Hammond said ITD has an annual budget amount and plans for maintenance of the most pressing problems with no funds given to an expansion of existing infrastructure. According to Hammond, projects will be looked at only in terms of maintenance. Expansion and creation will not be a priority. Infrastructure that is degrading and needs the most urgent care will be the projects the state plan focuses on using whatever funds are available. For those of us that drive long distances everyday, we have been fortunate having a mild winter for driving conditions, up until the past few days. Remembering to slow down and to not follow too close, will help all of us get to where we need to go safely. One accident and your stuck in traffic for a while. With a lot more snow in the forecast this week. Please remember to drive safely. We will be closed on January 16th, 2012 for the holiday. 1. Enacting a long-term surface transportation reauthorization bill. 2. Managing in lean times -- how states address the problem of the nation's aging bridges, highways, and transit systems with stagnant or reduced funding. 3. Responding to and planning for natural disasters. 5. Increasing the visibility of transportation as an issue in the upcoming presidential campaign. 6. Generating new ways to fund transportation. 7. Advancing intercity passenger rail. 8. Engaging the business community in support of transportation. 9. Serving a growing elderly population, both rural and urban. 10. Responding to new stormwater reforms and other environmental regulations. Our federal and state legislatures haves a lot on their plate. We will keep you informed if they come up with any solutions. Here is a survey by the American people in winter of 2011. It's quite interesting and the survey rates: Barrack Obama's performance and well as other potential presidential candidates, prioritizing funding, as well as demographic information. KMPO Board Meeting This Thursday - January 5, 2012 @ 1:30 p.m. The monthly Kootenai Metropolitan Planning Organization (KMPO) Board Meeting is this Thursday, January 5, 2012 @ 1:30 p.m. at the City of Post Falls, Council Chambers, 408 N. Spokane St., Post Falls, WA. The general public/citizens are always welcome to attend.